*Sorry for being a bad blogger the past week or so. I've been traveling and having visitors, so I haven't commented nearly as much as I usually do. I'll try to catch up in the next few days until I head out of town again for the weekend. Everything should be back to normal by next Monday or Tuesday. Anna Dressed in Blood was a fun page-turner that almost, but not quite, lived up to the hype. Ghost stories are not the most popular paranormal in YA, but they neither are they uncommon. 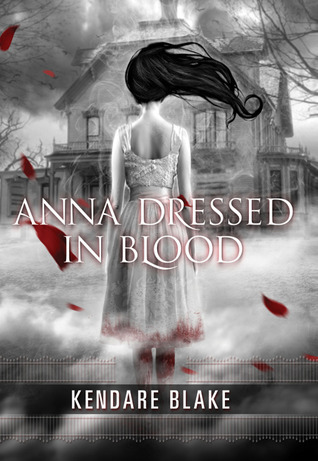 Anna Dressed in Blood is a new take on the traditional ghost story. Cas is a modern day Ghost Buster (Don't tell him that though. He makes a lot of swipes at the Ghost Busters). After his dad's death, he took up the family occupation of finding violent ghosts and re-killing them - with a special knife. Cas was the highlight of the story. I thoroughly enjoyed seeing the world through Cas's eyes. He starts off the book very arrogant and sure of himself. Not arrogant in a way that's annoying, but rather in the sense of a guy who is very good at what he does and knows it. I think his arrogance might also be masking insecurity and loneliness of not having any friends and moving so frequently. But you'd never know that. Cas is a lone gunman. When popular-girl Carmel and loner geek Thomas try to get in on his game, he pushes them back. But of course, since it's YA, eventually the friends get in on the game and it becomes a group effort. The game of which I speak is Anna. She is a seventeen year old ghost who was murdered on the evening of her first dance. She now haunts her old home, killing anyone who enters. But when Cas is pushes into the house as part of a prank she spares him. Why? We see in great detail that Anna doesn't spare most people. The book veers into the horror genre by highlighting several very gruesome killings. I didn't think it was scary or gross, but I don't scare easily. It was certainly fun to read though. Simply the willingness to go places most YA novels wouldn't dare is one of the best features of Anna Dressed in Blood. Anna is a wonderfully layered character. She is a nightmare in every sense of the word. But unlike the other ghosts Cas kills, she realizes the horribleness of her actions and hates herself for them. She and Cas form an odd sort of friendship. Part of him wants to kill her and part of Anna wants to die. Another part of Cas is fascinated by her and part of Anna wants to find a way to continue existing without violence. Despite knowing very clearly what Anna is capable of, I pitied her and wanted her to "live." While I get irritated by the "necessity" of placing friends in a prominent role in every YA, I did like Thomas and Carmel very much. Carmel especially. She is the queen bee - the beautiful, popular girl that everyone wants to either date or emulate. Kudos to Kendare for creating a unique "popular girl" mentality. Carmel had a dominating personality, but was also kind, smart, and brave. I liked that she insisted on staying involved in Cas's ghost quest. Thomas was a little irritating but in the somewhat endearing way of a little brother who always tags along. Thomas comes from a wizarding family and was very useful. He's the type of person who grows on you the more you get used to him. The plot was full of twists and turns. There was extreme violence, moments great sadness, page-turning suspense, even hints of romance. I did think the plot sort of petered out at the end. Once a big revelation about Anna was made, I thought the story became more predictable and a little cheesy. But on the whole, it was a very well done story. I would definitely check out Anna Dressed in Blood! I loved this book. Anna was really interesting and some of the stuff was definitely violent and freaky. I was mostly upset about the cat. The hitchhiker at the beginning was scary too. But I know what you mean about the end. Once Anna was like a normal girl riding along in the car I was kind of giggling but I still really enjoyed the book. I am really looking forward to this one- I recently received it from the publisher. Just my kind of book. Even though I don't usually like ghost-related things I think I'll read this one. It would certainly be refreshing, reading about Anna, a ghost herself. And I hope I can read those gore-ish scenes without being too freaked out! For some reason as soon as I read the synopsis I thought of the film Casper! A parent and teenager moving from town to town hunting for ghosts :) This books seems a lot scarier though. I think I'll be picking this us up for next Halloween. Great review! I always forgot that I need to read this book. It sounds like an interesting YA. You're right ghosts aren't common in this kind on books, so I was quite curious to read it. Great review. Terrible blogger! Hehe--I've done the same thing recently. Life intrudes and all. Welcome "back"! I really enjoyed this, cheesiness and all (I'm a sucker for cheese, though). Definitely a fave in my classroom! All bloggers take time off. You need to take a break sometimes. I don't know if I'll be reading this one. I've been taking a break from YA because I have having a hard time getting into them. There's not a single bad thing I could say about this book . . . just ADORED it! Great review! I loved this book and enjoyed all the Ghostbusters jokes. :) Glad that you liked it. It's the worry of "extreme violence" that keeps me from reading this despite all the great reviews! Aw, sorry you didn't like this one as much as I did! It had my attention from page 1 and it was really hard for me to put down. I loved Anna's complexity and Cas's witty humor. Looking forward to more Anna adventures in the second book. I thought the friends were pretty well integrated as pushy people who won't let Cas go through this alone. I haven't read too many ghost YAs so it's always a pleasant surprise to come across one and I usually end up enjoying it (just like I did with this one). I really enjoyed this book, too, though in hindsight, i can see that it has many flaws. I sometimes get carried away, I admit it, but I guess that's sort of the point. Wonderful review, Alison. And isn't the cover just stunning? I've seen many covers done by Nekro, and I liked each one. Still haven't read Anna... I just Hate scary stories! And I think I get scared easier than most... couldn't finish Miss Peregrine... but this sounds like a great book to recommend to kids who are looking for a horror story! Aw, sorry you didn't love this one quite as much as I did Alison! I loved how she managed to make Anna horrifying and vulnerable at the same time, I didn't expect to feel anything for a girl that literally rips a boy in half in the first half of the book. O_o Wonderful review as always though, I'll be interested to see if you continue the series! I'm sorry it didn't live up to the hype, but I'm glad you still enjoyed it. I also loved seeing the book through Cas's eyes. And, I loved Anna's layers. It made her all the more intriguing. I've been on the fence about this one. I had a chance to get an early copy, but I turned it down because I thought I probably wouldn't enjoy it. Now I'm wishing I'd taken them up on the offer! I'll have to find a copy because your review makes me want to read it. I really liked the book when Anna was a wicked bad @ss. When she turns part "soft" (for lack of better terminology - I was disappointed. I wanted a good (scary) ghost story... no need for a love twist. I really want to read this one but have been hesitant because of the gore factor. Although, I keep hearing that it's not all that bad. It sounds like a really interesting book, so I'm going to read it no matter what. Gotta see if I'll like it. Thanks for the review! I’ve read a couple reviews about this book now and I am actually starting to get interested in it. Most of what I am reading is like what you said, pretty good but it has a few things in it that just makes it okay. So, I will have to look into it! Thanks for sharing your honest thoughts, Alison. I hope you are having fun traveling. I'm eyeing out a copy of this one and have been reading reviews on blogs if I stumbled upon them. Cas reminds me of Dean Winchester from Supernatural. I really really need to stop procrastinating and pushing other books ahead of this one. I've had it on my book case for a while. Think it's time to pick it up! Loved the story of Anna! I can't wait to see what happens next. Great review!! I feel like everyone has read this book but me. I surly need to read it. This one's sitting on my shelf, and I'm glad to hear that you (mostly) enjoyed it! I've heard a lot of good things and can't wait to read it!